Losing Hope By Colleen Hoover: 5 Out Of 5 Stars! Time for the second review I promised you all! Colleen Hoover is an amazing author, this we already knew. So it’s no surprise that her book, “Losing Hope” would instantly earn a 5 out of 5 stars! For those of you who have read “Hopeless”, this is the same story, just from the character, Dean Holder’s, point of view. Could the story possibly get better when simply switching from Hope’s point of view to Holder’s? Some say no… because Hope (also known as Sky) does a pretty darn good job at letting the readers into her mind and her heart. What do I say? The story went from amazing, to godly! Having Holder’s point of view in “Losing Hope” gave the story so much more… i guess the word I’m looking for is “feeling” to it! We learn so much more about what Holder went through when he first recognized Hope, to the inner struggle and torment that he went through when dealing with the truth for himself. I have to say, a big part of what amazed me with this book was how Colleen was able to take an emotional story from a girl’s point of view, and transfer it to a boy’s point of view, and still keep him as a lovable masculine figure. A lot of writers get ragged on for trying to write males to show that they have emotions and feel pain, just as girls do. We lose no respect for Holder, even though he shows his weaknesses, and he lets the readers know that he is upset, he is emotional. And you know what? We love him even more for it. So I have to say, Colleen, you’ve more than earned a solid 5 out of 5, no like an 8 out of 5 for giving us Holder’s story! For those of you looking for a last-minute gift for the reader in your family, use your “one-click” and get this book! Colleen, keep up the good writing, and I can’t wait to see what 2014 has in store for you! 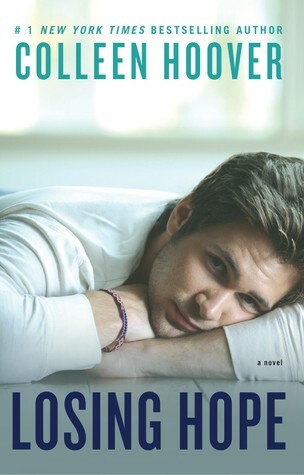 This entry was posted on Tuesday, December 24th, 2013 at 12:00 pm	and tagged with Blogging, Book, book reviews, Colleen Hoover, colleenhoover, Dean Holder, Hopeless, literature, Losing Hope, reading and posted in Books. You can follow any responses to this entry through the RSS 2.0 feed. « Long After By Cheryl McIntyre: 4 Out Of 5 Stars! Offically Hit 100 Followers! A Big Thanks To You All! Long After By Cheryl McIntyre: 4 Out Of 5 Stars! Casy has read 17 books toward a goal of 30 books.